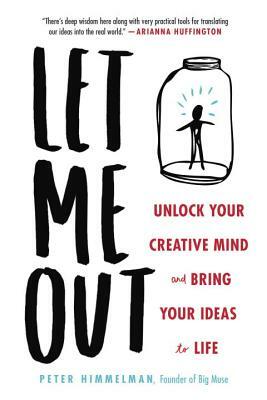 From award-winning musician turned communications expert Peter Himmelman, science-based techniques and simple exercises to get unstuck and unlock your creative potential. Do you want to stop procrastinating? Would you love to be more creative? Is there an idea you’ve dreamt of making a reality? Whether it's learning ragtime piano, losing 30 pounds, or starting an organic jellybean company, Himmelman's unique, inspiring methods will give you the tools and confidence you need to harness your fear and take steps to make your goals a reality. The perfect tool for anyone in a mental rut, Let Me Out will force you to stop listening to the negative thoughts that hold you back and achieve the professional and personal success you deserve. PETER HIMMELMAN is the founder of Big Muse, a company that teaches creative thinking, leadership skills, and deeper levels of communication in all facets of life--from personal to professional. As Big Muse has grown in popularity over the last four years, Peter has come to share his program with thousands of individuals, including charitable organizations, start-ups and international brands. A successful musician, he has been nominated for Emmy and Grammy awards, won the NAAPA Album of the Year Award, won six consecutive Parents Choice Gold Awards, and recieved six ASCAP awards.